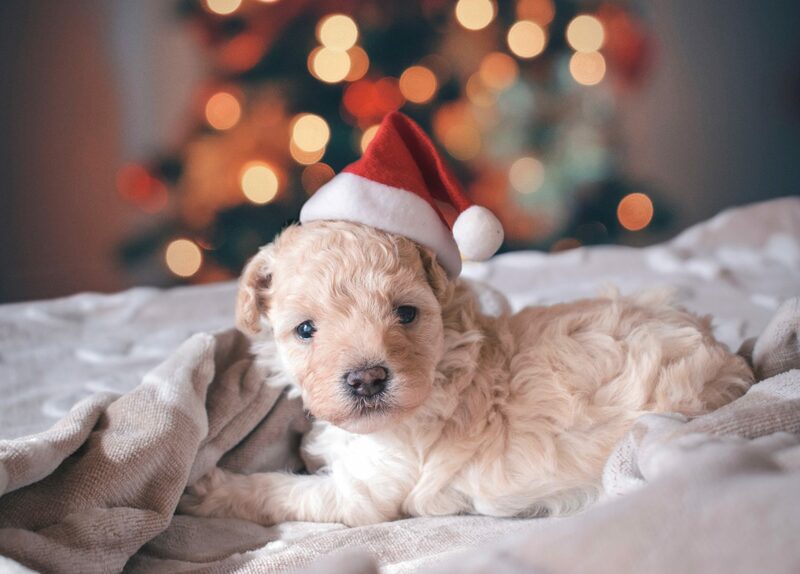 We believe the holidays are even more enjoyable when you share them with the furriest member of the family. That’s why we created a holiday guide that includes tips on making the most of this season with your pup! We’ve included gift ideas, safety tips, treat recommendations, and more. The rest is simple! Preheat your oven to 200 degrees F, combine the flour, salt, and water, knead the dough, lay it flat, cut out circles, and gently press your pup’s paw into the center. Be sure to make a hole at the top with a drinking straw before you place the ornament in the oven to harden. Clean off your dog’s paw if there is any residue. Your new ornament will be ready in 2 hours. Once dry, you can paint it however you like! Note that these are VERY high salt content. Ingestion of your homemade ornaments can be toxic to dogs and humans alike. Keep these out of reach from dogs and curious children! When it comes to this Chanukah tradition, you don’t need to leave your pup out of the fun! Instead of chocolate coins, use kibble! PawCulture.com recommends giving your dog their very own dreidel as traditional dreidels can be a potential choking hazard for dogs and cats alike. Plush toy dreidels are a good alternative and can still be used for the game. Wondering what you should put in your pup’s stocking or what to gift them over the eight days of Chanukah? We have some ideas! Try a combination of squeaky toys, clothes, treats, and maybe a new collar or leash. What’s cuter than matching pup-jamas? Check out these three sets that are sure to keep you and your dog cozy all season long. The holidays are a great time to take family portraits, no matter the size of your crew. According to the website The Nest, there are several ways to take great holiday pictures. Try taking your pictures outside, using nature as your backdrop. If you are taking your pictures inside, you can use props such as tinsel, Christmas lights, or your tree! To ensure a successful photo shoot with your pup, choose a time and place where he will feel comfortable and happy. The directions are easy! Preheat the oven to 325 degrees. Lightly grease a cookie sheet. In a large bowl, mix together the flour, ginger, and cinnamon. Mix in the oil, molasses, and water; let sit for 15 minutes. On a lightly floured surface, roll out the dough 1/4-inch thick. Cut out the cookies. Transfer to the cookie sheet and bake about 20 minutes until firm. Enjoy! Don’t leave your pup out of all the unwrapping fun! 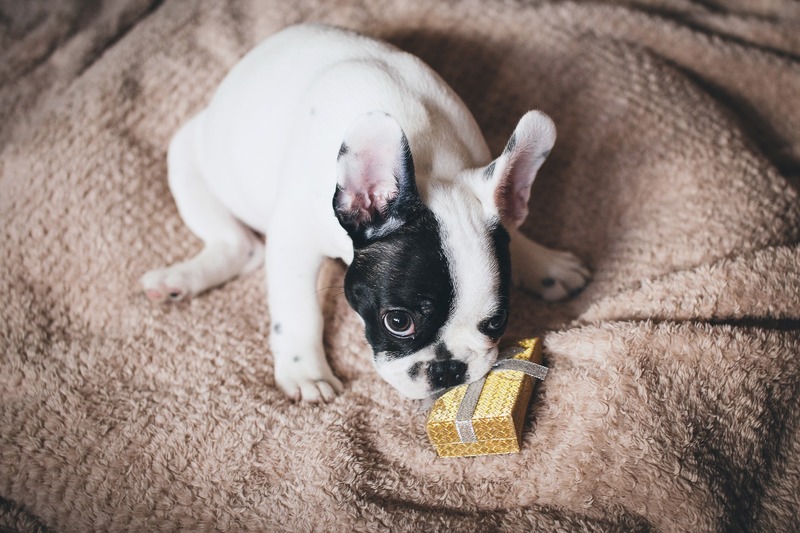 For them, unwrapping their gifts is definitely half the fun, especially if their new toy makes noise or they can smell the treats you’ve bought just for them. However, do not forget to keep gift wrapping material, especially ribbons and bows, out of your dog’s way. If accidentally ingested, this could mean a Christmas day trip to the emergency room. Don’t forget that safety is first and foremost! Here are some safety measures to keep in mind. The holidays can mean lots of family and friends in your home and around your doggo, be sure to designate a space where they can be alone if they get overwhelmed by all the noise and attention. If you decorate for the holidays, low-hanging decorations might be too fun to avoid for any four-legged family members. 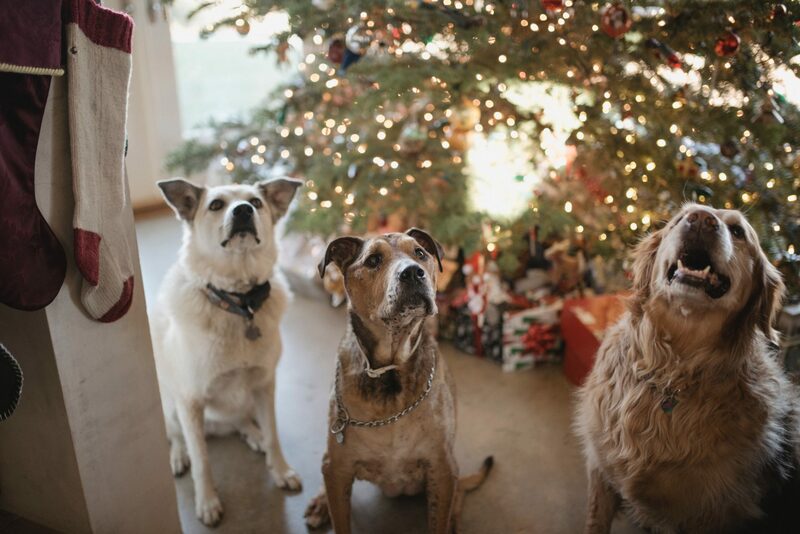 If your dog is rather young and curious, try hanging Christmas bulbs higher on your tree so that Fido doesn’t think these are things to pull off and potentially ingest. You’ll also want to keep the plugs for the lights well hidden. Similarly, if you have popcorn balls, chocolate ornaments, small dreidels, or an open flame from a menorah, make sure these are out of your dog’s reach! From frisbees to chew toys, check out our guide to all the dog-approved gifts recommended by the team at our Embark HQ’s! Happy Holidays to you and yours from the Embark team!